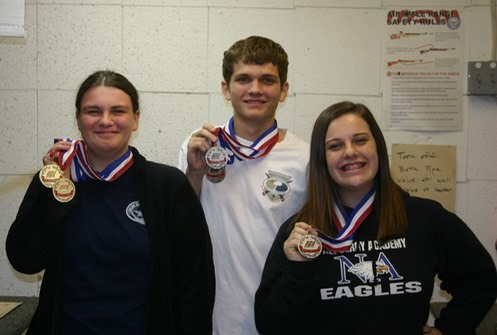 Members of the Newberry Junior Pistol Club traveled to Charleston on December 2nd to compete in the SC State Junior Olympic Pistol Championship that was held December 1st and 2nd at The Citadel. The competition consisted of international air pistol and 22cal. sport pistol. Our local shooters turned in an outstanding performance. The age of the competitors ranged from 12 to 19 years old, with the Newberry shooters being the youngest competitors there. In the ladies division Carrie Haltiwanger, at age 12 the youngest competitor in the competition, shot a personal best and took Gold in both international air pistol and 22 cal. sport pistol. By being the top State finisher in the ladies category, she earned an automatic invitation to the US National Junior Olympic Pistol Championship at Colorado Springs in April. Carrie's teammate Brianna Kinard finished a close second, only 3 points behind, to take Silver in international air pistol. In the mens division Sean Blanton put forth an outstanding performance shooting a personal best to take Silver in international air pistol. His strong performance in 22 cal. sport pistol was enough to earn him Silver also. Sean and Brianna are both looking forward to invitations to the US National Junior Olympic Pistol Championship also, but they will have to wait until the regular invitations are announced in January and February to see if they make the list. Newberry Junior Pistol Coach Ben Blanton is very proud of all of his shooters and their dedication to the shooting sports. The Club would like to extend special thanks to The Friends of NRA Foundation and Gun Owners of SC for their financial support, without which this program would not be available. Any junior shooter ages 8 to 19 that are interested in participating in the Newberry Junior Pistol Club may contact Head Coach Ben Blanton at 803-924-4694.